one of the most powerful 15-inch laptops on the market. 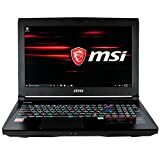 The MSI GT63 Titan 8RG is armed with a GTX 1080 GPU and an 8th Gen Intel Core i7 CPU, as well as a dazzling RGB keyboard and vivid Nvidia G-Sync display. It’s a bit on the bulky side, but if you’re looking for epic performance in a 15-inch chassis, it doesn’t get better than this. Gaming laptops with this amount of power soak up a lot of juice, so it’s no surprise that the GT63 Titan lasted only 2 hours and 48 minutes when continuously surfing the web over Wi-Fi at 150 nits of brightness. While the Titan did beat the Predator Triton’s 2:14, it came in slightly under the 3:32 premium gaming laptop average.Latest 8th Gen. Intel® Core™ i7 processor,Windows 10 Home / Windows 10 Pro Latest GeForce® GTX 1080 8GB GDDR5X with ultra performance,Per-Key RGB gaming keyboard by SteelSeries,Cooler Boost 5 – Revolutionary cooling module for enthusiastic gaming15.6″ Full HD (1920×1080) display with 120 Hz refresh rate and 3ms response time (optional),15.6″ 4K UHD (3840×2160) IPS level display (optional),Dragon Center 2.0,Easy Overclocking with MSI SHIFT Technology (optional). Nahimic 3 Audio Technology delivering 360⁰ immersive audio experience,Sound by Dynaudio system,Killer DoubleShot Pro (Killer Gb LAN + Killer 802.11 a/c WiFi) with Smart Teaming,Upgraded Killer Gigabit LAN Controller with Advanced Stream,Detect 2.0 and Killer Shield,USB 3.1 Type-C reversible plug,True Color 2.0 Technology for increased color contrast and greater image detail,Matrix Display supporting surround mode and 4K output up to 2 external monitors,MSI X Boost technology supports faster storage access speed. This is the ultimate gaming experience, fueled by the fastest performance, most advanced gaming technologies, and the best gaming ecosystem.GeForce GTX 10-Series GPUs give you up to 3X the performance of previous-generation GPUs. They’re built with ultra-fast FinFET, the latest high-bandwidth memory technologies, and support for DirectX 12 features to deliver the fastest, smoothest gaming notebook experiences. With the innovative Cooler Boost cooling solution and MSI’s special gaming features catered for gamers, the NVIDIA’s latest GeForce® GTX 1080 GPU shall be able to release its full performance completely on MSI gaming laptops. As the only gaming laptop with Full HD at 120Hz refresh rate and 3ms response time panel, this is the go-to companion you can count on to never lose a detail during chaotic gameplay. The level of realism is drawn from the panel’s ability to produce up to 120 picture frames per second, topped with 94% NTSC Color Gamut calibration to bring you the most vibrant visuals for your ultimate entertainment pleasures.